Hello I'm Nini from Nini and the Sea! We are all about having fun, quilting and making lots of things on our blog, so you can imagine there's a party every once in a while! We especially like Autumn and all the fun activities that go along with it. My family has started a tradition that everyone we know and love looks forward to every year: The Harvest Party. When Lynne from Lily's Quilts Blog asked what I would do with fabric from Abakhan Fabric Hobby Home of course I thought about something for our harvest party! I've made Mason Jar Ring Pumpkins and a Halloween Table Runner for fall home decorations, but the orange and bright colors used for Halloween don't really go with my dining area. What I need is a nice neutral pennant that I can keep hanging for longer than just party night and that's exactly what I made using these lovely fabrics. I also made a Trick-Or-Treat Loot Bag for those you know who are collecting candy! First up the Pennant Tutorial! - Fabric: I used two different patterns and one for the tape, but you can use however many patterns and colors you'd like! I cut my Peltex 72F stabilizer and fabric to 5 inch x Width Of Fabric (WOF) strips for the base of my flags. I placed fabric on both sides of the Peltex Stabilizer and pinned it in a few spots to keep it in position while ironing. Peltex gives you directions for using their stabilizer so I followed them to fuse the fabric and stabilizer. This is where your parchment paper comes into play! I ironed the fabric sandwich between parchment paper so any fusible glue that's sticking out from the stabilizer doesn't fuse to my ironing surface or iron. Your pennant doesn't look as nice when it's fused to your ironing board! I marked both edges of the fused fabric every 6 inches, staggering the marks evenly. For example, I started marking the left side of the strip from the end and every 6 inches, but on the right side I made the first mark at 3 inches and then every 6 inches. This ensured that my marks were staggered evenly. When I lined up the ruler from the mark on the left side to the staggered mark on the right side it made uniform triangle pennant shapes. See! Nice triangles that will be equal in size! I have a specific space I want my pennants to go, so I measured the space and added at least a foot extra on each end. This is the measurement you will use to make the fabric tape to attach your pennants to. Adding the extra room allowed me tie a loop in the tape for hanging and to make sure the pennants hung with a little swag. To make your fabric tape you need to cut enough 2 1/2 inch x WOF strips to cover the measurement you took in the above directions. Sew your 2 1/2 inch fabric strips together on the short ends. Iron your long 2 1/2 strip in half to make a crease in the middle. Then open and fold raw edges to the middle crease and iron again (pictured above). Now fold your strip in half the long way again and iron one last time to secure. This will make a nice channel for you pennants to be sewn into and hide the raw edges of the fabric. To align the pennants, you just push them into the channel you made until they hit the top of the tape. I made the flags sit right next to each other in the tape (less than 1/4 inch between them! ), that way they'll all look the same and hang evenly. This also keeps all your raw edges tucked inside the tape. Next I pinned the wide edge of each pennant to keep it in place while sewing. Now sew the pennants to the tape with a 1/4 inch seam and your pennants are complete! I've made pennants the "hard way" before: I didn't use the Peltex. I had to sew the flags, turn them inside out, and iron them flat which is quite a lot of work! I found this way much easier and less of a hassle. When the pennant is only used for a short time, this easier way works for me! I also made a Trick or Treat loot bag with my Abakhan fabrics. I followed a tutorial for a drawstring back pack by Skip to my Lou Blog. I followed Cindy's directions exactly except I added reflective tape to each side of the bag. Because my backpack might be used at night, I like the added safety for my lil ones. The reflective tape is fusible, but I would stitch along at least two edges of it to secure it to the bag. For ease I would do that before the bag is assembled. I love the old fashioned candy fabric, with the other two fabrics from Abakhan. The cording, eyelets and reflective tape were from my stash. The eyelets really help add strength to the bag. 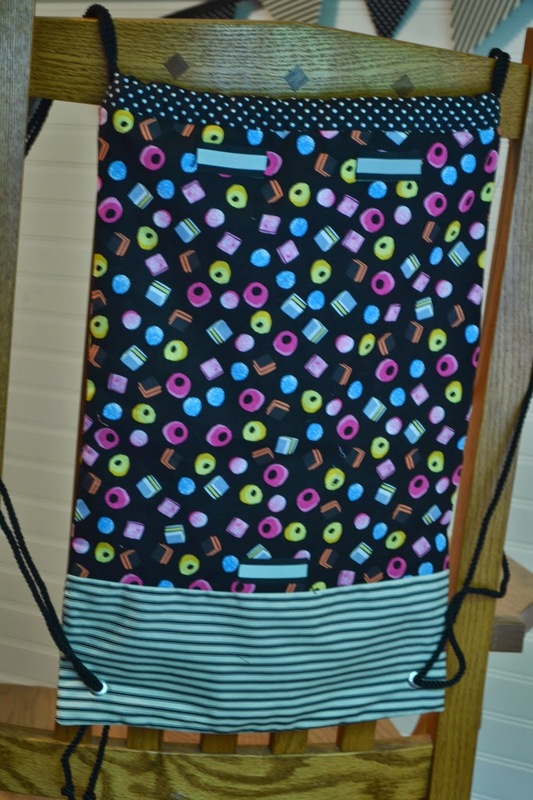 Candy can get heavy and I feel the eyelets will help keep the bottom of the bag (where all the weight will be) together. Thank you Abakhan Fabrics Hobby Home and Lynne from Lily's Quilts Blog, it was great getting poste from across the pond and being included in the fun! Great tutorial and such cute projects!! Thanks! The tutorials look wonderful and easy to understand! The treat bag is great and know that I will be making the pennant in the future! Thanks to Nini and you for sharing!